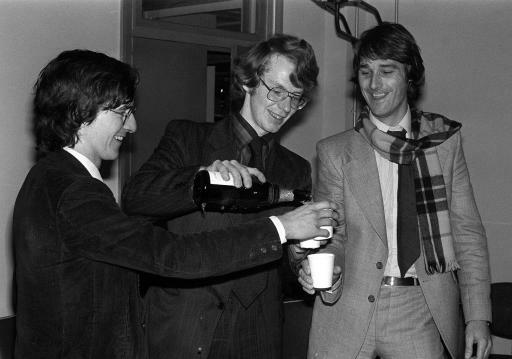 In February 1977, charges under Section 1 of the Official Secrets Act were brought against journalist Duncan Campbell (left), Time Out reporter Crispin Aubrey (centre) and former SIGINIT operator John Berry (right). This was the first time that a Section 1 charge had been brought against non-spies. The charges related to a meeting between the three men, held in Berry's flat, where the work of GCHQ had been discussed. The trial became a cause celebre. Anonymous witnesses from the intelligence community arrived by horsebox, known only as Colonels 'A', 'B' and 'C'. The Attorney General was forced to admit that the jury had been secretly vetted by the security authorities. During the trial, unprecedented publicity is given to GCHQ, making it impossible for the government to continue to uphold the 'lie' that Britain did not do SIGINT in peacetime. Worse followed. The Judge threw out the Section 1 charges, calling them 'oppressive'. In the words of Geoffrey Robertson QC, by the time the three men stood outside the Old Bailey as free men and drinking champagne, 'Britain was a less secret country'.